Barbie is not just a cute doll for little girls. Barbie is not just the world's favorite lifestyle icon. For a span of five decades, this lovable doll has held over 130 careers such an astronaut, surgeon, teacher, pop star, veterinarian, and yes, even a presidential candidate. 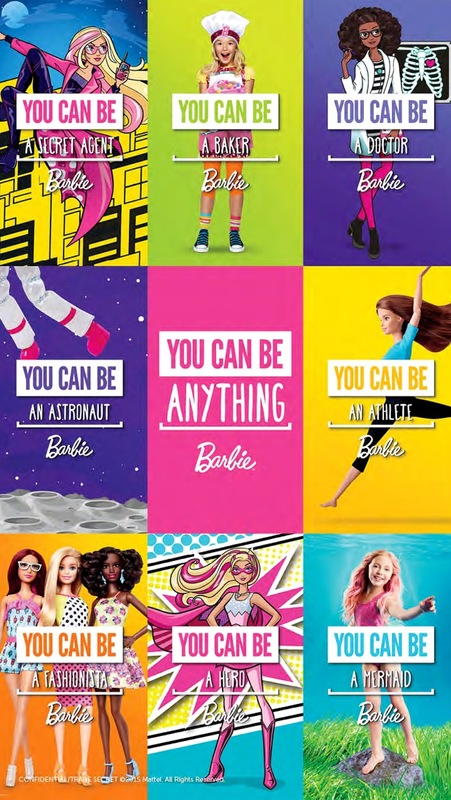 Of course, there are also the countless imaginary careers that Barbie held given to her by that creative little girl who plays with her at home. The You Can Be Anything Campaign was launch last summer to empower little girls not just to play with Barbie but to pursue and live out their dreams. Imaginative play is helpful in developing a child's eagerness to achieve her goals in life later on. To further extend this message, Richprime Global Inc., the exclusive distributor of Barbie and other Mattel toys like Hot Wheels, Fisher-Price, Thomas & Friends, Monster High, Ever After High, BOOMco., Matchbox and Mattel Games in the country, in partnership with The SM Store and Toy Kingdom, set up the You Can Be Anything Day at the SM Mall of Asia Atrium. Meant as a gateway to the imagination, the venue is laden with multiple interactive booths featuring a range of professions young girls can freely try out. In a span of a day, little ladies can participate in different activities such as creating scrumptious sweet treats at the Doll-icious Bakeshop, where they can design their own cupcake or cookie using the rainbow selection of frostings and toppings available. Or they could choose to work on their next artistic masterpiece at the Barbie Artsy Studio. For the more outgoing and expressive girls, they can grab the opportunity to be a news anchor doing her primetime spiel at the B-TV News Room. They can even bring home a copy of their news spiel record as a memento. And of course, any Barbie event wouldn't be complete if there wasn't anything dedicated to beauty and fashion. For the more kikay (but still equally brilliant) bunch, they can drop by the Barbie Pink Salon and Fashion Closet to get an exclusive beauty blow out or a quick style make-over. A short program and interactive fashion show later on serves as the cherry on top of the fun, with Andi Eigenmann and her daughter Ellie strutting the catwalk. "We're looking at this event as a jump-off point to young Filipina girls," explains Ms. Liza Yao, Managing Director of Richprime Global, Inc. "We want to inspire, and have them see that they can be anything they set their mind to and further beyond that, just like Barbie."